By Edward J. Wickson, A.M. The gobelet method has been around a long time. 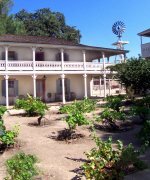 It was the most common manner for vines to be trained in 19th century California vineyards. The following is an excerpt from a book that summarized horticulture in California in the 1880's. Most of the varieties of vinifera grown in California at present thrive under the short pruning system. The prevalence of the short pruning system frees growers from the expense and inconvenience of trellises. Though in the early years of the vines stakes are used, our older vines stand by themselves and are as independent of supports as are our fruit trees. The vines are, in fact, shaped upon something the same model as our fruit trees, the so-called "gobelet form" of the French being our prototype. An effort will be made to describe briefly how this form is attained. During its first year in the vineyard the cutting is allowed to make all the growth possible without interference. 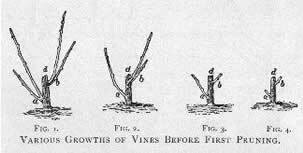 After the fall of the leaves the following winter, the vines will be found to have made varying amounts of growth, according to individual vigor, as shown by the accompanying engraving, ranging from Fig. I, which is a good growth, down to Fig. 4 which is a feeble growth. In these figures d represents the wood of the cutting which was planted with two buds above ground; a is the lowest shoot of each, which in the first three instances, Figs. 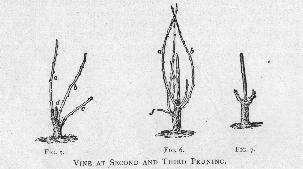 1,2, and 3, should be cut back to two buds, and all the other shoots removed entirely - leaving, however the old stem wood in each case, as it is useful to tie the new shoots to during the following summer. In the case of the feeble growth, Fig. 4, the shoot b is to be removed and a allowed to stand as it is, in the prospect of its picking up strength and making growth enough to be cut back to two buds at the end of the next season. During the second summer, vigorous vines will send out shoots five feet or more in length, according to the inherent strength of the variety or the favoring situation, and of these the most upright and vigorous should be selected to serve as the foundation of the future trunk. It should be cut back so that the second bud from the top of the part that is left shall mark the height desired for the first fork of the coming goblet-shaped head. This cane should be tied to a stake and all other buds save the three at the top rubbed off. All other canes should be closely cut away. The engraving Fig.5 shows at a the cane to be chose to form the future vine, while b and c are to be cut away cleanly. At this point practice varies in this State. Instead of rubbing off the lower buds as advised, some growers allow laterals to grow below the future head and the laterals bear fruit and are afterwards cut away. The result is that a trunk is afterwards formed with scars for the removed laterals instead of smooth trunks., which are secured when the lower buds are rubbed away. The grower has to decide whether this fruit is worth more to him than the healthier and more vigorous vine which will probably be secured by dispensing with this early fruit. During the third summer canes will grow from the vines something as shown in Fig. 6, and considerable fruit will be borne. Sometimes all these canes are allowed to grow through the season, but it is better practice to rub off other shoots when two or three vigorous ones can be selected to form the main branching of the trunk. It is also customary to pinch off the main shoots after they have grown out a foot or so. This pinching results in the growth of leafy laterals which shad the fruit and add to the stockiness of the main canes. At the winter pruning which follows these two or three main canes are cut back to two or three buds, the greater number of buds being left on the more vigorous vines. All other shoots are cut away cleanly. This operation fixes the first fork of the vine head, as shown in Fig. 7. The fourth summer most vines will put forth a number of canes and bear a good crop of fruit, though some varieties are later in bearing. The same treatment is given the vine as during the preceding summer, and at the following winter pruning each branch is allowed to retain two spurs of two or three buds each, according to the strength of the vines, as aforesaid. Thus the vine which was left in Fig. 7 at the third pruning becomes the form shown is Fig. 8 at the fourth winter pruning. After the fourth year the pruning proceeds upon the same plan, the number of branches being increased as the vigor of the vine seems to warrant, until the trunk shows the gobelet form as shown in Figs. 9 and 10. From year to year the number of buds left on the spurs depends upon the ability of the vine to produce the fruit and make a healthy growth.